This is a variation on my “Hems Going Down” posts. (Part 1: 1926) (Part 2: 1928.) 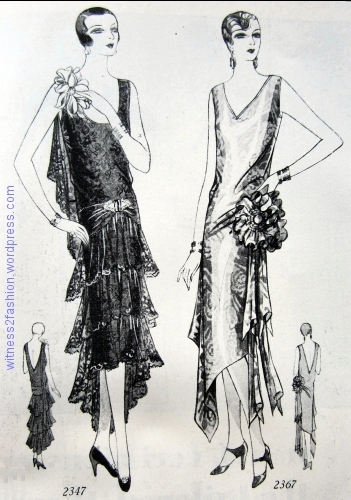 While collecting images of 1920’s dresses with high-low hemlines, side drapes, back drapes, and handkerchief hems, I realized that I had quite a lot of pictures of late twenties’ dresses with tiers of flounces, often sharing a page with dresses that feature gigantic bows which flow into side drapes, etc. 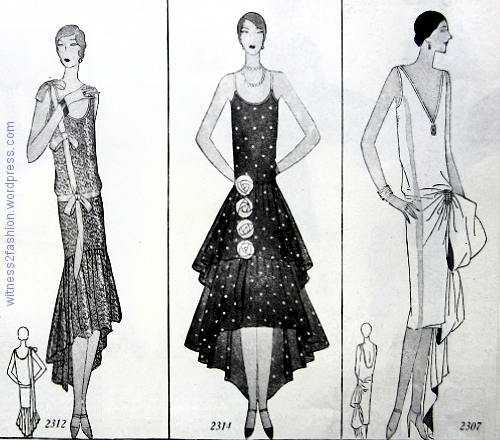 “Formal Frocks for the Holidays;” Delineator, Dec. 1928. Butterick patterns 2347 & 2367. 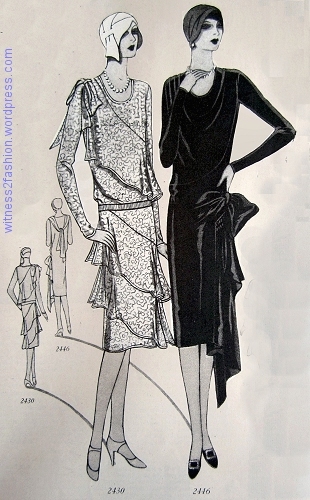 Formal gown by Chanel, illustrated in Delineator, Nov. 1928. 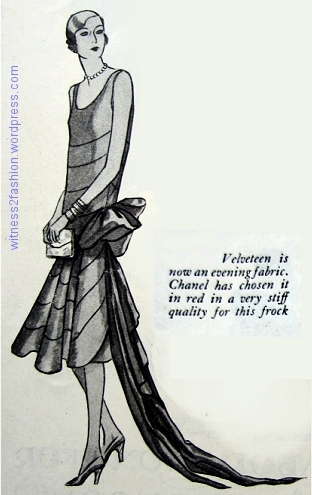 Velveteen evening frock from Chanel, illustrated in Delineator, Nov. 1928. “Velveteen is now an evening fabric. Chanel has chosen it in red in a very stiff quality for this frock.” The complexity of that cut would be daunting for a stitcher, in any fabric! 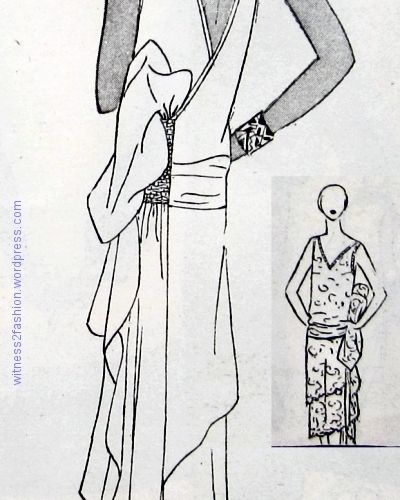 Evening gown by Lucien Lelong, illustrated in Delineator, Nov. 1928. “This is the new tulle frock of the winter — it is all in tulle, from flowers to hemline. Lelong.” Note Lelong’s indecision about the waistline, with the dress’ belt lower than the waist of the slip. 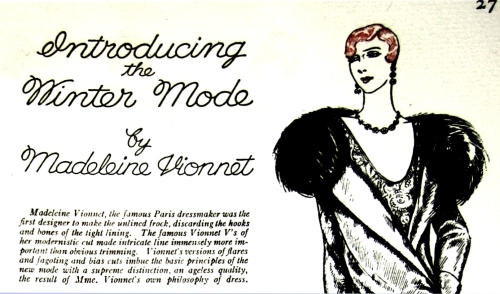 Evening dress by Vionnet, illustrated in Delineator, Nov. 1928. “White chiffon and the glitter of white strass and crystal beads are used by Vionnet for this frock.” ‘Strass’ refers to a type of rhinestone. The skirt looks heavy with beading, and it seems to have a draped (cowl) neckline. 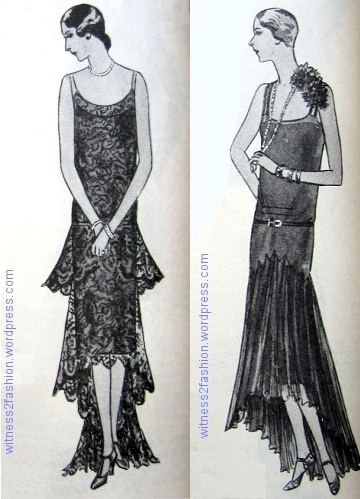 Paris evening dress by Louiseboulanger, illustrated in Delineator, Nov. 1928. “Here Louiseboulanger has revived old-fashioned brocaded satin in brilliant yellow.” [Louise Boulanger’s design house used her name as one word, frequently all in lowercase letters.] Note the enormous amount of fabric used in the side drape — perhaps as much as used for the dress itself! Chanel, left and Lelong, right. 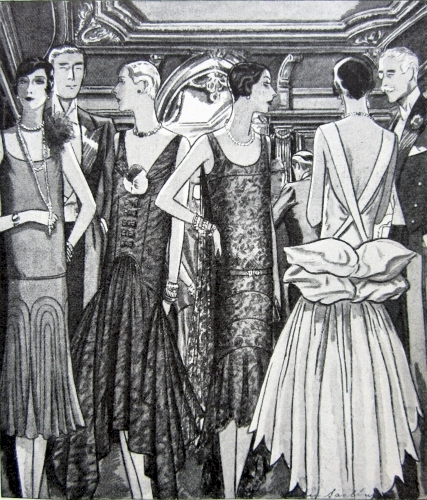 Illustrated in Nov. 1928. 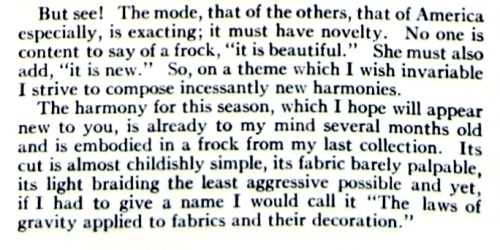 “For Dancing, Dining and the Opera,” Butterick patterns 2312, 2314, 2307. 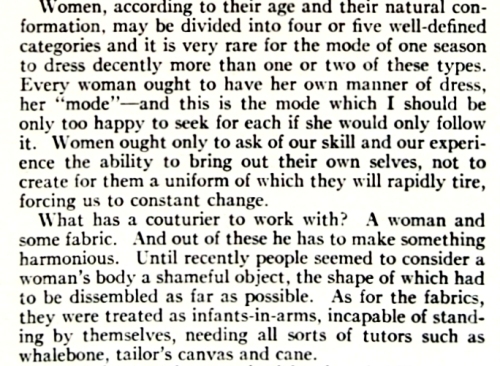 Delineator, Nov. 1928. The center dress, if made in softer fabric and without the rose trim, would come very close to the black, chenille-embroidered Chanel. A massive amount of fabric is ruched into the bow of Butterick 2317, Nov. 1928. Butterick patterns 2325, 2314. 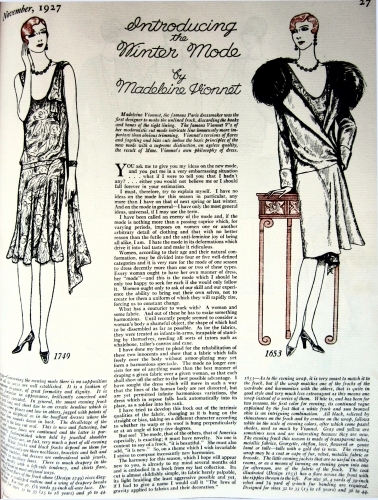 Delineator, Dec. 1928. 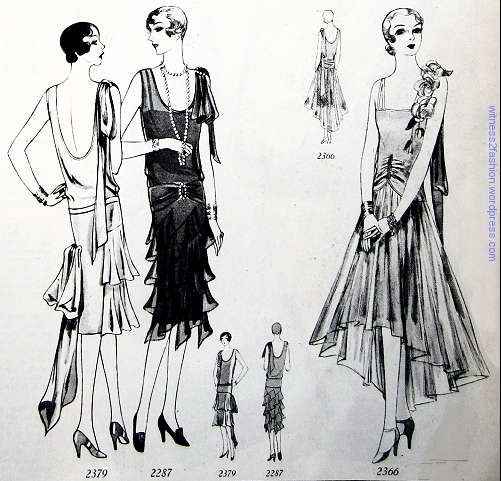 The afternoon dress on the left has a high-low hem. Butterick patterns 2379, 2287, 2366. 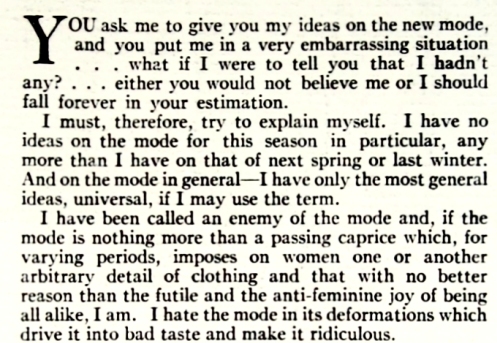 Delineator, Dec. 1928. The one on the left above has flounces and a bow. 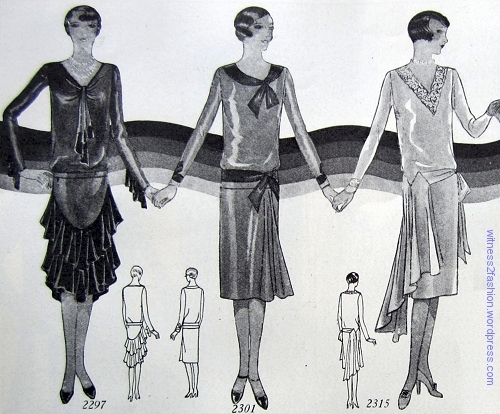 The high/low-hemmed dress at right is for a young woman. “This lace frock is the most formal of daytime fashions.” Butterick 2430. 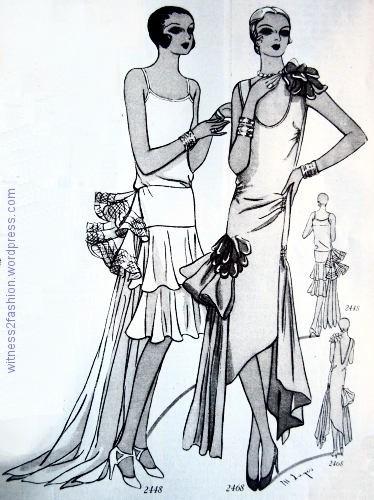 Butterick 2446, right, has a cowl neckline attributed to Vionnet. It’s rather austere, except for its enormous bow. Feb. 1929, Delineator. 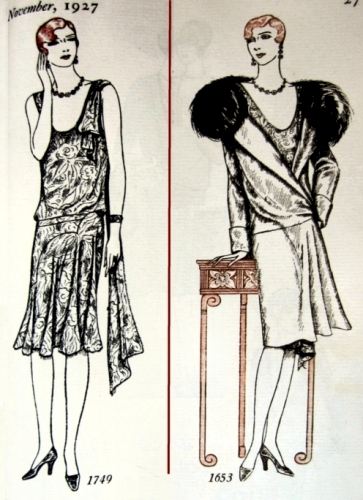 Flounces and great big bows: Butterick patterns 2448 and 2468, Delineator, Feb. 1929. The “bow” on the left seems to be flounces stiffened with horsehair. 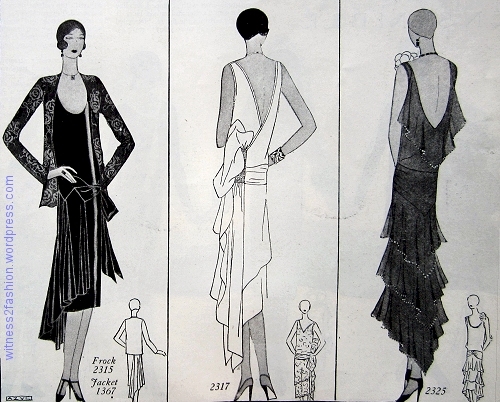 Although the “pillow” bow on the right is outrageous, the curved seams in the chiffon dress (far left) and the lace dress (center right) are real tests of sewing skill. The lace dress has both the uneven hem and sheer top [“the effect of a transparent yoke of lace or chiffon . . . . 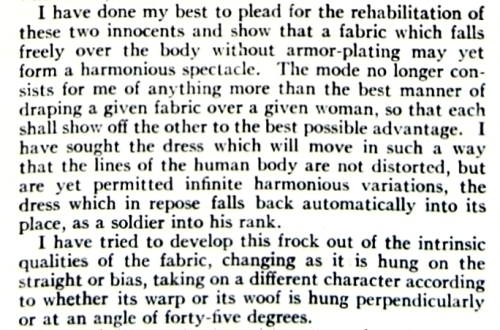 The skirts, almost without exception, have an uneven hemline.”] described in The Delineator.